At Adopt A Highway Maintenance Corporation® we want to help you have a more sustainable Christmas. That’s why we’ve created this list of five ways to be more sustainable this holiday season. These five tips will require little effort from you while keeping your holiday green! An easy way to become eco-friendlier is by switching your Christmas lights to LED lights. These types of bulbs are more energy efficient than traditional incandescent lights, which means reduced energy usage during this holiday season. By switching to more energy efficient Christmas lights, you can lower your electricity bill. Some people may tell you that it is detrimental to the environment to use a real tree for the holidays; however, this is incorrect. Nowadays, Christmas trees typically come from tree farms that are grown specifically to accommodate holiday festivities. Some trees grow faster than others, such as Pine and Douglas fir. Given the fact that they can replenish themselves quicker than other types of trees, they are more sustainable than artificial trees. The overall goal for this holiday is to implement more sustainable practices that will benefit the environment. Have you ever taken the time to think about how much paper is thrown away during the holidays? There is an easy fix to this waste management issue, and the answer is recycled wrapping paper. Several companies sell eco-friendly gift-wrapping products that are made from recycled paper, such as The Container Store. We understand that Christmas gifts must be decorative, which is why companies like The Container Store sell recycled wrapping paper in several assorted colors and patterns. Being sustainable doesn’t mean sacrificing style! 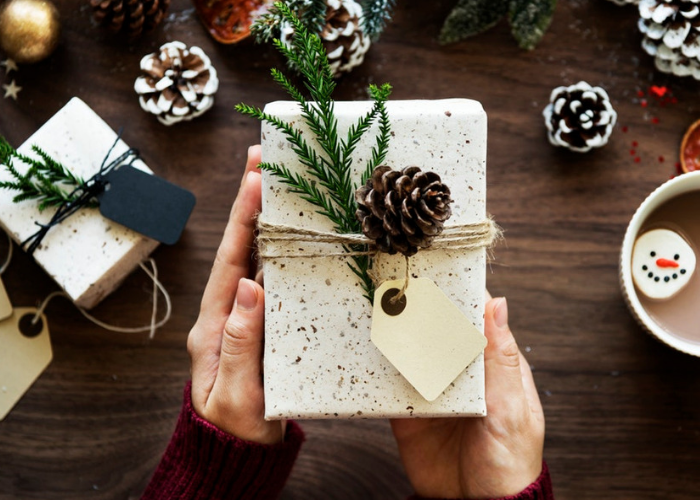 When choosing gifts this holiday season, avoid products wrapped in tons of plastic and focus on more natural items made from sustainable materials, such as bamboo, beeswax, or cotton. Purchasing items made from these materials will offer you many gift options from candles, bed sheets, cutting boards, and much more. Whatever you purchase this year, remember eliminating waste and buying products made from sustainable materials is always the way to go. Shopping bags tend to be tossed as soon as we begin gift wrapping, so why do we need them in the first place? Let’s encourage one another to bring our reusable bags when running errands this holiday season. Eliminating plastic waste by bringing your shopping bags is a small adjustment that can result in a significant positive impact on the environment. Becoming eco-friendlier doesn’t require drastic changes, but rather small adjustments that will make a substantial impact. The holidays are busy enough, so make it easy on yourself!